For the 1958 short story by Karen Blixen, see Babette's Feast (short story). Babette's Feast (Danish: Babettes gæstebud) is a 1987 Danish drama film directed by Gabriel Axel. The film's screenplay was written by Axel based on the story by Isak Dinesen (Karen Blixen). Produced by Just Betzer, Bo Christensen, and Benni Korzen with funding from the Danish Film Institute, Babette's Feast was the first Danish cinema film of a Blixen story. It was also the first Danish film to win the Academy Award for Best Foreign Language Film. The film premiered in the Un Certain Regard section of the 1987 Cannes Film Festival. The story flashes back 49 years, showing the sisters in their youth. The beautiful girls have many suitors, but their father rejects them all, and indeed derides marriage. Each daughter is courted by an impassioned suitor visiting Jutland – Martine by a charming young Swedish cavalry officer, Lorens Löwenhielm, and Philippa by a star baritone, Achille Papin, from the Paris opera, on hiatus to the silence of the coast. Both sisters decide to stay with their father and spurn any life away from Jutland. Thirty five years later, Babette Hersant (Stéphane Audran) appears at their door. She carries only a letter from Papin, explaining that she is a refugee from counter-revolutionary bloodshed in Paris, and recommending her as a housekeeper. The sisters cannot afford to take Babette in, but she offers to work for free. Babette serves as their cook for the next 14 years, producing an improved version of the bland meals typical of the abstemious nature of the congregation, and slowly gaining their respect. Her only link to her former life is a lottery ticket that a friend in Paris renews for her every year. One day, she wins the lottery of 10,000 francs. Instead of using the money to return to Paris and her lost lifestyle, she decides to spend it preparing a delicious dinner for the sisters and their small congregation on the occasion of the founding pastor's hundredth birthday. More than just a feast, the meal is an outpouring of Babette's appreciation, an act of self-sacrifice; Babette tells no one that she is spending her entire winnings on the meal. The sisters accept both Babette's meal and her offer to pay for the creation of a "real French dinner". Babette arranges for her nephew, a merchant, to go to Paris and gather the supplies for the feast. The ingredients are plentiful, sumptuous and exotic, and their arrival causes much discussion among the villagers. As the various never-before-seen ingredients arrive, and preparations commence, the sisters begin to worry that the meal will become a sin of sensual luxury, if not some form of devilry. In a hasty conference, the sisters and the congregation agree to eat the meal, but to forgo speaking of any pleasure in it, and to make no mention of the food during the dinner. Martine's former suitor, Lorens, now a famous general married to a member of the Queen's court, comes as the guest of his aunt, the local lady of the manor and a member of the old pastor's congregation. He is unaware of the other guests' austere plans, and as a man of the world and former attaché in Paris, he is the only person at the table qualified to comment on the meal. He regales the guests with abundant information about the extraordinary food and drink, comparing it to a meal he enjoyed years earlier at the famous Café Anglais in Paris. Although the other celebrants refuse to comment on the earthly pleasures of their meal, Babette's gifts break down their distrust and superstitions, elevating them physically and spiritually. Old wrongs are forgotten, ancient loves are rekindled, and a mystical redemption of the human spirit settles over the table. The sisters assume that Babette will now return to Paris. However, when she tells them that all of her money is gone and that she is not going anywhere, the sisters are aghast. Babette then reveals that she was formerly the head chef of the Café Anglais, and tells them that dinner for 12 there has a price of 10,000 francs. Martine tearfully says, "Now you will be poor the rest of your life", to which Babette replies, "An artist is never poor." Philippa then says: "But this is not the end, Babette.. In Paradise you will be the great artist God meant you to be" and then embraces her with tears in her eyes saying: "Oh, how you will enchant the angels! ", which is precisely how the short story ends. Blixen's original story takes place in the Norwegian port town of Berlevåg, a setting of multicolored wood houses on a long fjord. However, when Axel researched locations in Norway, he found the setting was too idyllic and resembled a "beautiful tourist brochure." He shifted the location to the flat windswept coast of western Jutland and asked his set designer, Sven Wichmann, to build a small grey village resembling a one-horse town. Mårup Church, a plain Romanesque church built around 1250 on a remote seaside cliff near the village of Lønstrup, was used as a backdrop. Axel altered the setting from a ship-filled harbor to fisherman's rowboats on a beach. He said the changes would highlight Blixen's vision of Babette's life in near complete exile. The Nordisk Film production company suggested the cast of Babette's Feast should include only Danish actors to reduce production costs. However, Axel wanted Danish, Swedish and French actors to play the roles for the sake of authenticity. Axel was supported by the Danish Film Institute's consultant, Claes Kastholm Hansen, who also agreed the cast should include international stars. The title character of Babette was initially offered to Catherine Deneuve. Deneuve was interested in the part but was concerned because she had been criticized in her past attempts to depart from her usual sophisticated woman roles. While Deneuve deliberated for a day, Axel met with French actress Stéphane Audran. Axel remembered Audran from her roles in Claude Chabrol's films Violette Nozière (1978) and Poulet au vinaigre (1985). When Axel asked Chabrol (her former husband) about Audran's suitability, Chabol said Audran was the archetype of Babette. Axel gave the script to Audran, told her that Deneuve was contemplating the role, and asked her if she might be able to respond before the next day. Audran called two hours later and said she wanted the role. The following day, Deneuve declined and Audran was officially cast. Two other major parts were the characters of the elderly maiden sisters, Phillipa and Martine. Phillipa, the once-promising singer, was portrayed by Bodil Kjer, considered the first lady of Danish theater and namesake of the Bodil Award. Birgitte Federspiel, best known for Carl Dreyer's 1955 classic film Ordet, was cast as the staid, love forlorn, Martine. The role of the Swedish General Lorens Löwenhielm, the former suitor of Martine, was accepted by Jarl Kulle and the Swedish Court Lady by Bibi Andersson. Both had achieved international recognition as two of Ingmar Bergman's favorite actors, appearing in many of his films. The group of elderly villagers was composed of Danish actors, many of whom were well known for their roles in the films of Carl Theodor Dreyer. These included Lisbeth Movin as the Old Widow, Preben Lerdorff Rye as the Captain, Axel Strøbye as the Driver, Bendt Rothe as Old Nielsen and Ebbe Rode as Christopher. The popular Danish actress Ghita Nørby was cast as the film's narrator. Although production consultants complained to Axel that the use of a narrator was too old-fashioned, Axel was adamant about using one. He said it was not about being old-fashioned but only about the need: "If there is need for a narrator, then one uses one." The seven-course menu in the film consisted of "Potage à la Tortue" (turtle soup) served with Amontillado sherry; "Blinis Demidoff" (buckwheat cakes with caviar and sour cream) served with Veuve Cliquot champagne; "Cailles en Sarcophage" (quail in puff pastry shell with foie gras and truffle sauce) served with Clos de Vougeot Pinot Noir; an endive salad; "Savarin au Rhum avec des Figues et Fruit Glacée" (rum sponge cake with figs and candied cherries) served with champagne; assorted cheeses and fruits served with Sauternes; and coffee with vieux marc Grande Champagne cognac. Upon its release in 1987, Babette's Feast received overwhelmingly positive reviews. The film won the 1987 Best Foreign Language Film at the Academy Awards. It also received the BAFTA Film Award for Best Film Not in the English Language. In Denmark, it won both the Bodil and Robert awards for Best Danish Film of the Year. The film was nominated and/or won several other awards including a Golden Globe nomination, the Grand Prix (Belgian Film Critics Association) award and a Cannes Film Festival special prize. As of March 2016, the film maintained a 96% approval rating on the Rotten Tomatoes aggregate review website. After the film's release, several restaurants offered recreations of the film's menu. ↑ "Babette's gæstebud". Danish Film Institute. ↑ "Festival de Cannes: Babette's Feast". festival-cannes.com. Archived from the original on 2012-10-03. Retrieved 2009-07-20. ↑ Nielsen, Bent (30 September 2008). "Kirken på kanten synger på sidste vers" [Church on the edge sings the last verse]. Kristeligt Dagblad. 1 2 3 (Mørch 2008, p. 403) translated from "Der er meget, der fungerer på skrift, men når det blive overført til billeder, giver det slet ikke samme indtryk eller følelse. Alle de ændringer, jeg foretog, gjorde jeg faktisk for at være tro mod Karen Blixens." ↑ Heiter, Celeste (2012). A Culinary Homage to Babette's Feast. Love Bites: Romantic Dinners for Two. lovebitescookbooks.com. p. 1. Retrieved October 6, 2014. ↑ Wigley, Samuel (3 April 2014). "Then and now: Babette's Feast reviewed". Film Forever. British Film Institute. Retrieved 6 October 2014. ↑ "The 60th Academy Awards (1988) Nominees and Winners". oscars.org. Retrieved 16 August 2015. 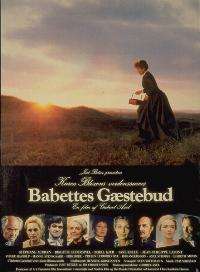 ↑ "Babettes Gaestebud (Babette's Feast) (1987)". Rotten Tomatoes. Flixster IOnc. Retrieved 4 March 2016. ↑ Fabricant, Florence (March 2, 1988). "In 'Babette,' A Great Feast For the Palate And the Eye". New York Times. Retrieved 4 March 2016. Curry, Thomas J. (2012). "Babette's Feast and the Goodness of God". Journal of Religion & Film. 16 (2). Archived from the original on December 8, 2012. Goodwin, Sarah Webster (1990). "Knowing better: feminism and utopian discourse in Pride and Prejudice, Villette, and Babette's feast". In Jones, Libby Falk; Goodwin, Sarah McKim Webster. Feminism, Utopia, and Narrative. Tennessee Studies in Literature. pp. 1–20. ISBN 978-0-87049-636-3. Podles, Mary Elizabeth (1992). "Babette's Feast: Feasting with Lutherans". The Antioch Review. 50 (3): 551–65. JSTOR 4612569. Schuler, Jean (1997). "Kierkegaard at Babette's Feast: The Return to the Finite". Journal of Religion and Film. 1 (2). Wright, Wendy M. (1997). "Babette's Feast: A Religious Film". Journal of Religion and Film. 1 (2).